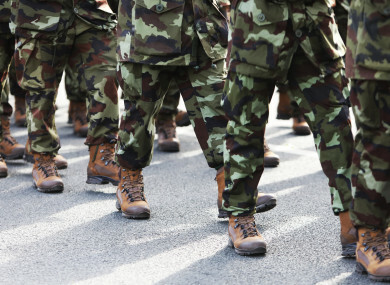 CONSIDERATION SHOULD BE given to allow defence force unions affiliate with the Irish Congress of Trade Unions (ICTU), according to a new report given to Minister with Responsibility for Defence, Paul Kehoe. PDFORRA, which represents soldiers, sailors and aircrew of the permanent defence force, has long been campaigning for trade union rights for its members. In 2014, it launched a complaint against the government under Articles 5 and 6 of the European Social Charter stating that its members did not have the right to strike. It also made the case that it was not allowed to take part in collective bargaining over pay or be affiliated with an umbrella trade union organisations and therefore could not take part in national negotiations on public sector pay. The European Committee of Social Rights ruled that the defence forces should be entitled to collective bargaining rights. Last year, the minister announced a review of the current defence forces Conciliation and Arbitration Scheme (C&A). The report, seen by TheJournal.ie but which has yet to be published found that space should be given to explore the union having closer ties to ICTU. …the official side should, with the consent of the minister engage in discussions with the ICTU. The practicalities of a representative association forming association/affiliation with the ICTU should be explored while giving due consideration to any likely conflict that might arise between such an arrangement and the obligations of military service. Should this be viable, discussions could then continue on a more formal basis to include the representative associations. It adds that ICTU should be approached so as to ascertain conditions attached given that industrial action is “irreconcilable” with military service. The report adds that any link up with a trade union by the military cannot impede on the delivery of essential services by the defence forces. The report states that “given the restrictions of military service and in particular the prohibition on taking strike action… it is of paramount importance that the defence forces have access to dispute resolution machinery that is comprehensive, easy to access, timely in its operation, independent and enjoys the confidence of all the parties who use it”. During the last public service pay negotiations, union reps believed that they had only a peripheral involvement, and were side-lined by the government, according to the review document. In order to “devise confidence building measures” and ensure the unions effective participation in such processes they should be involved in Public Service Pay negotiations, as well as the Public Service Pay Commission, it states. The report also states there are two processes in which members can make complaints on issues such as pay and conditions and other matters. The most recent data from the Grievance Management Office for the period January 2016 to the present, show that of the 172 complaints referred to the Redress of Wrongs (RoW is the complaints process for individuals) process – seven related to pay and conditions and 165 to other matters. The most recent data from the C&A Scheme for the period January 2016 to the present, show that of the 198 individual cases referred to it, 173 related to pay and conditions and 25 to other matters. Email “Union membership for soldiers should be considered, finds review”. Feedback on “Union membership for soldiers should be considered, finds review”.